As a whisky aficionado and a wine lover my trips usually contain either a visit to a distillery or a vineyard. For this summer's trip to Corsica I had the intention of visiting at least one vineyard. Me and my love entered Porto-Vecchio by ferry from Nice around 7 am in the morning, having many hours to kill until we could check-in to our hotel. We strolled around the city center before anything had opened up, when to my big surprise I found a Corsican whisky through a stores window. The distillery's name was Domain Mavela. Thanks to Internet I quickly calculated that we were merely 69 km away from the distillery, I booked a distillery tour at ten and enjoyed the scenery of the Mediterranean sea by car. Entering the gates of the distillery was a baffling moment, a distillery as beautiful as can be, surrounded by vineyards. I have seen a few distilleries in Sweden, Scotland and Germany, but never as eye catching as this one. We arrived 30 minutes before the distillery opened up. I couldn't resist to step into the surrounding vineyards, and taste the ripe grapes. When the tour finally began I was already exhilarated from my own vineyard tour. A slight problem with the distillery tour was that it was in French, a language that I have yet to master (or at least learn a few phrases). The guide, however, spoke English so I could ask some questions. I also got a pamphlet in English with the essentials. I probably misunderstood some of the information so the following will not be a completely accurate description. Hopefully I will be able to shed some light on the technicalities and workings of this distillery which makes liqueurs, fruit brandies and whisky. My focus will, of course, be on their whisky though. The whisky creation is a joint venture between Domaine Mavela and the Pietra Brewery. Pietra is very famous on the island from the making of the first Corsican beer, which is made from chestnut flour. I have tried the Pietra beer, and found it to be delicious. 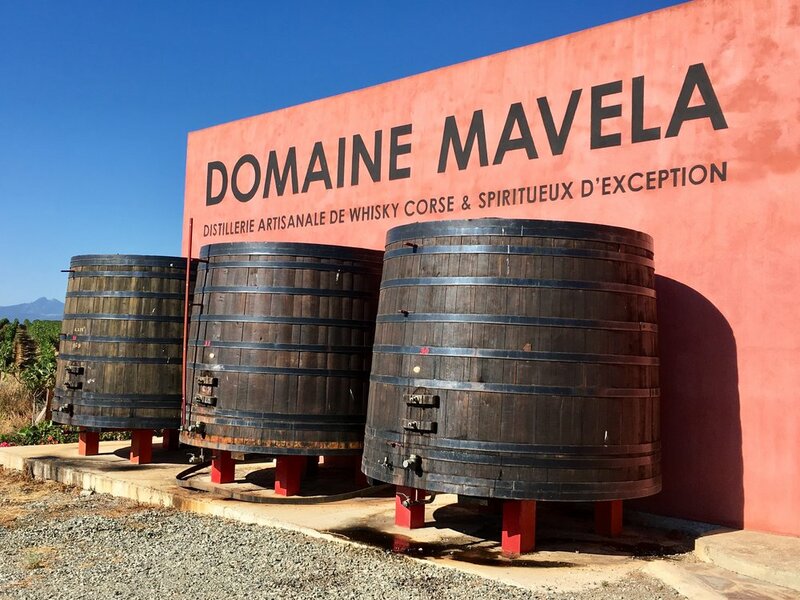 Together Domaine Mavela and Pietra Brewery decided to create a Corsican whisky, completely in their own way, without the influence of the way the Scottish make their whisky. They wanted the whisky to be sweet and spicy, influenced by native Corsican spices. Corsica is also famous for Mattei Cap Corse, a liqueur infused with Corsican plants, and Mavela has supported Mattei financially during a time of struggle. This has made a great impact of the flavors of the whisky. They certainly differ in every aspect compared to the standard ways of whisky making. The mash bill is close to the beer Pietra makes. The mash tun is a 10.000 liter round vessel where the wort is created over several days. The still consists of both an alembic and a column still. The spirit passes through both stills during the whisky distillation. They mature the whisky solely in French oak casks from the famous forest of Tronçais. All the casks has first matured Corsican white wine from the muscat grape. This is done through agreements with several of the famous wine producers on the island. All of the whisky is of course matured for at least 3 years. Now to the finished whisky. They brand the whisky as P&M (Pietra and Mavela). There are two versions, one is called "vintage". It's a pure malt made from 3 different vintages between 3 and 13 years of maturation age. I tasted a small sample and found it uninteresting, too immature and too diluted. The other is the "single malt", which is matured for 7 years and only in casks that has previously held muscat wine from Domaine Gentile. From my own personal experience Domaine Gentile make some stunning wines. My tasting notes of the single malt might be clouded by the surroundings. I have sampled in on different balconies on the island, overlooking the ocean and getting aromas from flowers and trees. I'm already in love with this beautiful island, and also in the whisky. The whisky is bottled at only 42 % ABV, by the way, yet it is full-bodied and very flavorful. When I first opened the bottle a powerful herbaceous aroma hit my nose, packed with eucalyptus, pine trees (maybe from the surroundings) and anise. The taste was sweet and spicy. The taste matched the nose as a symphony orchestra follows their conductor. After some 10 minutes in the glass it calmed down and much of the herbs and spices subsided. I added a few drops of water, which opened it up but at the same time made it too flat. Without water the 7 yo single malt is sweet with some odd spices that I have not found in any whisky before. I like to drink absinthe, vermouth, and wines with different botanicals. I would describe this one as a sweet whisky with a hint of wormwood and loads of eucalyptus. I love it, especially in it's correct habitat, the Corsican island. Do not compare this one with your regular whiskies, this is not a scotch imitator, it is a Corsican whisky. It is well crafted, and it has no off-notes. There is nothing immature sticking out It is sweet and oaky with a long nice finish. Overall well integrated. I am confident that P&M have succeeded in making their own kind of whisky! Thomas has previously reviewed the P&M 7 YO Corsican Whisky without the benefit of the fine surroundings of Corsica. Have a look at his notes here, and you will see we agree on the major points. I do believe I had a much greater experience all-in-all though, and I would recommend to one and all to visit Corsica at some point.